Outgoing postcard US-3429583 to Florida was produced by Smithsonian Institution and printed in Singapore in 1988. 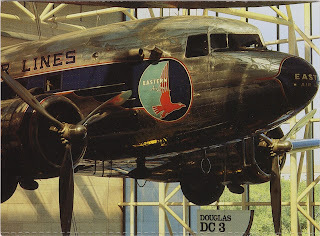 It shows a Douglas DC-3, a fixed-wing propeller-driven airliner with a cruise speed of 207 m/h or 333 km/h and a range of 1,500 miles or 2,400 km, exhibited at the National Air and Space Museum. It bears an Eastern Airlines logo. Billed as the most successful airliner in history for its streamlined, versatile design and strong wing construction, the Douglas DC-3 dominated both commercial and military air transportation from its introduction in 1935 until after World War II. At least 400 of these airplanes are still flying today. Update: The card reached the destination after 38 days on July 17,2015.